Costa Rica has pledged to be carbon neutral by 2021 and the farmers are marching forward adopting eco-friendly approaches. Interestingly women farmers are taking a lead. 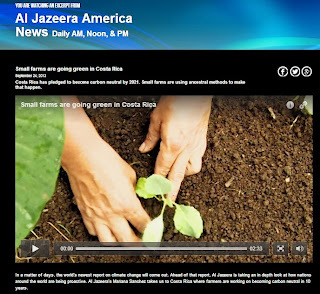 View a news clipping on Aljazeera on the initiatives of small farmers going green in Costa Rica. I had an opportunity to train the farmers and farmer groups in Costa Rica in green technologies for sustainable farming. 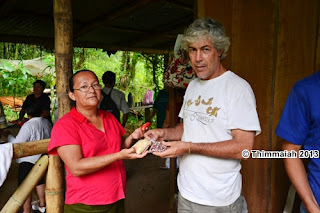 Amongst the farmers, Ms. Maria Luisa is a 'women hero' leading the small farmers movement in Costa Rica. An innovative climate smart women farmer from Costa Rica is extremely passionate on what she does. She also trains fellow farmers in low-cost organic agriculture technologies. These activities are promoted by Fundecooperacion, Asociacion Coordinadora lndigena y Campesina de Agroforesteria Comunitaria Centroamericana (ACICAFOC) and the National Institute for Innovation and Transfer of Agricultural Technology (INTA), Ministry of Agriculture, Costa Rica. Empowering women is very crucial for alleviating poverty and rural development. After the Millennium development Goals (MDG) come to an end, the post 2015 sustainable development agenda should focus on gender equity and equality in agriculture. Maria Luisa's case is a beginning and also an example for other women, organisations and nations to emulate. Family farms are small farms or homesteads wherein all the farming activities are undertaken by the family members. The size of these farms can vary from a fraction of a hectare upto 2 hectares. Some of the international development organizations define family farms, whose size is less than 2 hectares. 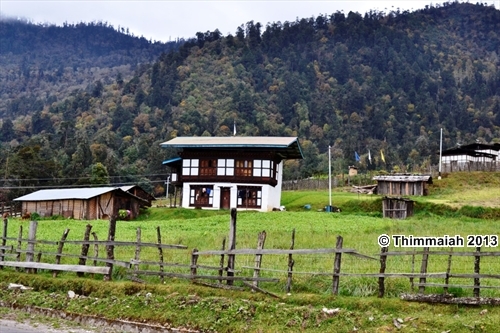 Globally there are about 500 million small farms and more than 85% of them are in Asian region. The major Asian countries with large number of small farms are China (193 million), India (93 million) and Bangladesh (17 million). In addition to food security, these small farms play a very important role in ecosystem management, biodiversity conservation, climate change, youth development, gender inclusion, empowerment of the poor and urban migration. Looking into the importance of the small farms in rural development and poverty alleviation, the United Nations General Assembly has declared 2014 to be the 'International Year for Family Farming'. The common notion is that the large industrial farms as the major source of food for the growing population which is not fully true. 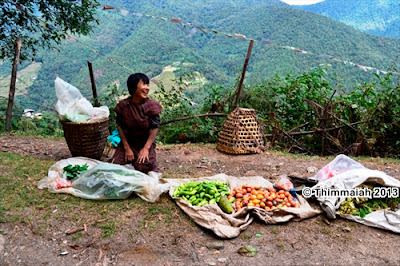 In many developing countries small farms contribute significantly to the food security. In India alone more than 80% of the farms are less than 2 hectares and contribute to more than 50% to farm output. Studies across the globe have shown an inverse relationship between farm size and productivity. Smaller the size of the farm more attention is given to cultural practices, selection of seeds or planting materials and crop care. In addition the family members contribute their own labour and produce on-farm inputs which keeps them employed throughout the year. Interestingly the general trend in these family farms is the diversity of crops that are being cultivated. Every region has its own requirement for specific crops depending on the food choices, culture and heritage. 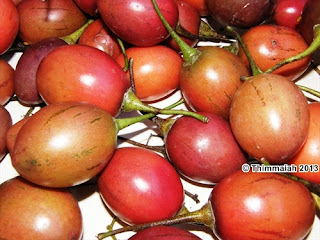 For instance, cherry tomatoes are preferred over the hybrid tomatoes which are generally found in the markets. Likewise many lesser known vegetables are cultivated in these gardens. Moreover a majority of the crops are grown using open pollinated seeds or heirloom seeds which have an inherent diverse gene pool than the modern hybrids. The heirloom or native seeds are more resilient to the vagaries of weather vulnerabilities and are resistant to the pests, diseases, drought and water logging stresses. 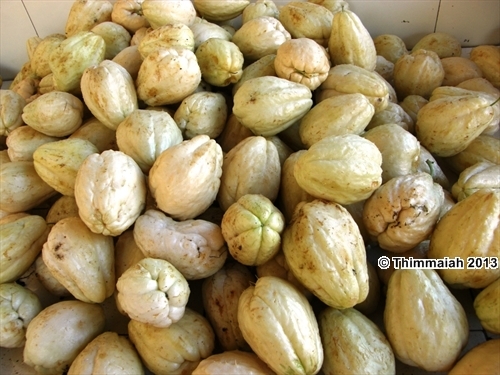 In other words these local seeds or vegetables assure them of food and nutritional security. Even now these farmers continue the tradition of seed sharing which is a scientific way of seed conservation and utilization of biodiversity. Amongst the family farms most of them are of the size of a tennis court approximately 1/10th of an acre which is about 400 square metres. The question is; can a family comprising of 4 members meet their food requirements in such a small piece of land? If the land is optimally designed utilizing the available natural resources, it can produce enough food to meet the requirements of a family. There is a need to rethink on what to grow, how to grow using the concepts of deep sustainability. We hear about sustainability so often in its shallow understanding, which to a large extent emphasises on doing ‘things right’ so that our actions do not dwindle the opportunities for the future generations. They are more addressed towards solving pollution problems, mining of natural resources, recycling, reuse and other approaches to address the symptoms of the problem. We need to move further in doing ‘right things’ which has deeper sustainability connotation. Small kitchen gardens or homesteads can be transformed into a food producing landscapes if we consider 3 important parameters; weather patterns or climatic conditions of the region, choice of right crops and farm design. Mono-cropping or cultivating of one crop would nullify the concept of family gardens. A good mix of diversity apt for the regional agro-climatic conditions would do the trick. Our global food system unfortunately focuses on grains, few tubers, oilseeds and beans. About 15 crops meet more than 75% of the calorie requirement of the world population. However, in nature there are 7000 plants which are edible and can be used as food. Most of these plants do not require intensive care for its production. Let’s now see how to make a small farm sustainable and productive. Perennial crops are very important for small farms. These are the plants which survive for atleast one to three years or more which are grown for their edible parts like; leaves, stem, flowers, fruits, and roots. Planting these perennials would reduce lot of farming work like ploughing the land which requires manual labour or machines which does add on to the cost of production. Also there is no need to sow seeds every season, planting has to be done once while the crop needs to be tended with regular manuring and irrigation. It would also reduce the cost and time on managing weeds as there would be less weed growth. In addition to reduce the drudgery and cost of production these perennial crops help to reduce the carbon emissions by building up the soil organic carbon. The deep root systems help to recharge the ground water. Some of the perennial vegetables that can be cultivated are Tree tomato or tamarillos (Solanum betaceum), tree brinjal, Drumstick (Moringa oleifera) Curry leaf,( Murraya koenigii ), Indian Perrenial Cucumber or Miniature Cucumber or Ivy Gourd or Scarlet Gourd (Coccinia grandis, Coccinia indica), Jack fruit (Artocarpus heterophylla). It’s important to choose crops which can yield more from a minimal area. There are many crops which has an innate potential to produce more food that fits into the family farms or homesteads. Wise choice should be of those crops that require minimal care and maintenance. 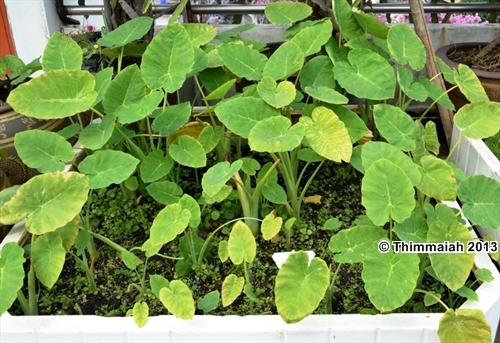 Some of such crops are Colocasia (Colocasia esculenta) wherein the leaves and the tubers are used as food. In one hectare of land Colocasia produces 15 to 30 tons of tubers which can be stored for a couple of months. Cassava or Tapioca (Manihot esculenta)is another crop which yields about 20-40 tons per hectare. 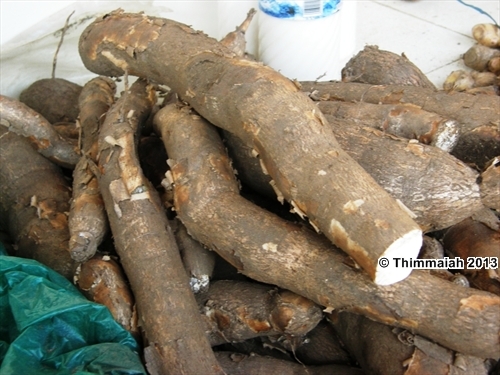 Each Cassava plant in 8-9 months yields 8-12 kilograms with minimal care. Cuttings are used for planting. 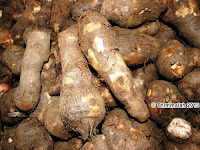 The nutrient rich cassava leaves can be used a a good animal fodder. Care should be taken that the leaves should be wilted in sun before feeding to animals to lower the potential cyanide toxicity and also to reduce the free tanin levels. 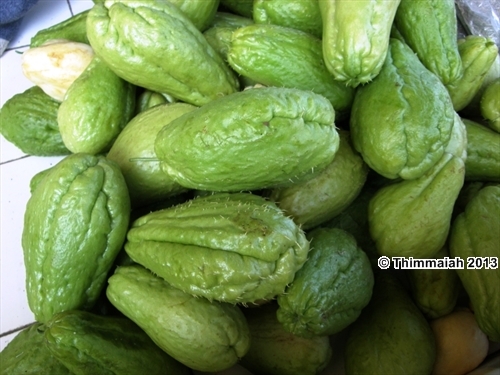 Another interesting creeper which yields more is Chouchou or Chayote (Sechium edule) which yields atleast 100 fruits in a single vine. Each fruit weight 300 to 500 grams. 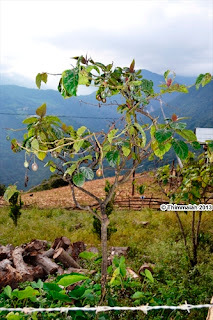 In Bhutan and Nepal Chayote is known as 'Iskhus' There are many such high yielding potential crops apt for a particular agro-climatic region which needs to be identified and planted in homesteads. Sustainable farming practices are vital to the success of family farms. Whatever biodegradable wastes that are available in the farm can be transformed into manure. The weeds and crop residues of the farm can be easily composted by using earthworms or by aerobic methods. 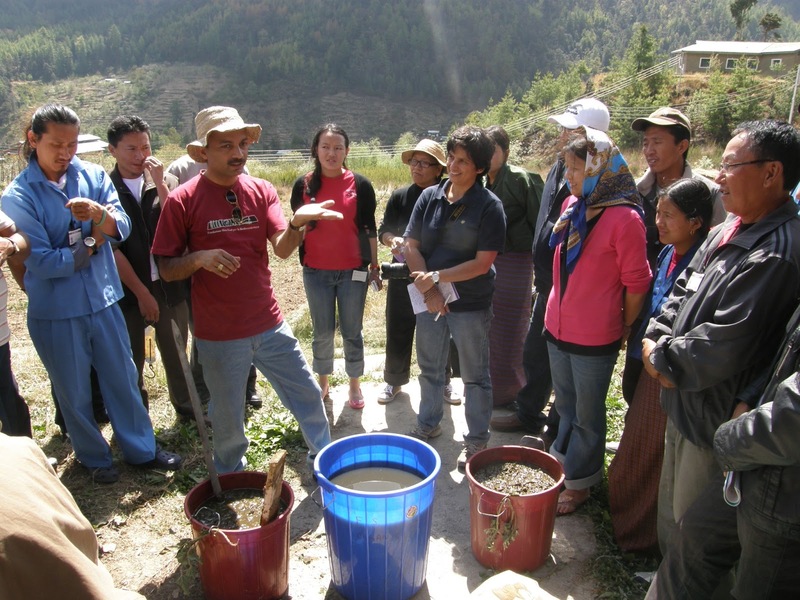 The resulting product, compost can be used for providing crop nutrition to plants which inturn builds soil fertility. Moreover the problem of waste management can be addressed at home itself. I would keep the surroundings green and clean. Farmers can produce their own seeds by continuing the ancient wisdom of seed sharing with the fellow farmers which would maintain the seed vigour and avoid inbreeding depression. With simple training programs, farmers can be trained in seed production of heirloom or open pollinated varieties so that there is no mixing of unique characteristics of a particular plant due to cross pollination. Moreover the heirloom seeds are resilient to the climate change and biotic stress. Similarly pest management measures can be designed based on the species that are available in the locality. Most of the weeds which have a strong odour can be used as bio-pesticides. Some of the herbs like mint, rosemary, thyme can also be fermented and used as sprays to repel insects and manage plant diseases. Family farming is very important in the present scenario wherein the arable land is dwindling and there is a global rush for land by private organizations and governments. The development of industries and housing are encroaching the fertile farming fields and displacing the farming communities. Agriculture is a sector which not only provides employment to more than 70% of the world’s population but also provides many environmental services for the very sustenance of human population. Studies reveal by 2050 about two third of the world’s population will be staying in cities. How to accomplish the food requirement of the burgeoning population? Who would provide employment to the exodus of rural populace to the cities? Many such macro-economic and geo-political questions need to be answered in the years to come. Family farms can be a solution for these global problems. There are very few courses available online which can teach you simple, low-cost approaches for an organic garden or farm. Every farm or a garden is ‘an organism’ by itself. Organic Agriculture can be sustainable only if all the inputs required for cultivation of crops and livestock are produced in the farm. Every garden or farm is blessed with almost all the resources required for crop and animal production. There is a need to understand the local ecology and expand the human ingenuity to identify the natural resources and use them effectively. Entire globe is waging a war on weeds. What are weeds? Are they unwanted plants or plants without any worth as we generally understand? NO. If we can understand weeds they are wonderful plants full of potentials and offer many possibilities to address the present problems in gardening or farming. I wish to redefine weeds as the ‘plants whose uses are not known yet to the human beings’. There is no plant in this existence which is useless. The moment we understand the use of weeds, these plants start disappearing from our gardens. It would be worth an exercise to rethink on sustainability and transform your garden or farm into an ecological landscape where the role of every entity is understood and used for food production. All the requirements for farming like; seeds, manures, plant growth promoters and natural pesticides can be prepared on-farm utilizing the local resources. How to produce organic seeds in your own garden or farm? How to treat seeds with wood ash, milk? Use of local earthworms in composting? Simple method of composting which does not require turning? Use of locally available plants for managing pests and diseases? Protect your trees from rabbits and deer? Homa or Agnihotra in farming? Use of Lunar calendar (Jyotish) in farming? You don’t need to have any prior qualification for registration. The only requirement for this course is ‘YOUR PASSION’. Climate Change is a hot topic in every scientific forum wherein terminologies like adaptation, mitigation have become buzzwords of late. Not much discussion happens on food choices in most of the climate change seminars and workshops. It is very important to know that food choice also contribute to climate change. Every individual has a freedom to choose food, however if we do not make conscious choice we will be doubling the trouble. One of the biggest advantages of the present information technology era, is the availability of enormous information on a click of a mouse. Prior to choosing any food one needs to ask how, where and when that food was produced. In this blog let me focus on meat produced from industrial animal farms and its impact on climate change. Significantly large area under agriculture is for food production which also includes animal husbandry. The industrialised animal production for meat and diary is one of the major contributors to Green House Gases (GHG) leading to climate change. Meat Industry is responsible for about 18 % of GHG emission which is about 4% more than the vehicular pollution. It is unfortunate that with the increasing income levels for a large population the meat consumption is also taking an upward trend. The average meat consumption globally is about 115 grams per day which translates into 42 kilograms per annum. Meat production when seen in totality amidst severe cruelty to animals create a series of environmental problems which magnifies the effect of climate change. Lets examine how choosing meat in your diet will contribute to climate change. To meet the increasing demand for meat, more and more land is required for raising pastures and also to grow livestock feed like soybeans and corn. Consequently forests are cleared to create additional land to meet the feed needs of the livestock industry. It is a leading driver of deforestation and a significant contributor to global warming emissions. Studies reveal that nearly 60% of the agricultural land around the world is used in the production of beef, which provides less than 2% of the world's consumed calories. Shockingly, about 70-80% of the agricultural land is used by the meat industry for feeding the animals which is about 30% of the global land mass. Instead of feeding the animals, had the same land been used for food production, about one billion poor can be prevented from hunger and malnutrition. The clearing of forests or deforestation for cultivation of feed/ fodder to animals creates many problems that are interconnected. The first impact of deforestation is the loss of top soil by rain which otherwise would have been retained in the forests. Top soil is very important as it is a rich source of nutrients for the biodiversity to flourish. Without topsoil the micro-flora and micro-fauna perish which restricts the ground water from recharge. Also rainfall which happens due to the natural humidity of the forests stop and over a period of time the land becomes arid and dry transforming into a desert. The impact doesn’t stop there. The dust storms frequently occur in these arid deserts because soils are not bound with organic matter or humus which becomes amenable for dispersion during strong winds. Such storms move quite far off distances and create respiratory problems in other countries and also severely affect the coastal ecosystem. At present about 41% of the world’s land area is arid and dry which has a direct impact on about 2 billion people living in and around such arid regions. One should visit an industrial animal farm to understand the ground realities. Thousands of animals are stacked together in one unit which are cramped with minimal space for their natural movement. Treatment of these animals and their slaughter is a painful situation to watch. At times I wonder why humanity has lost compassion for these creatures. In the industrial animal farms wherein thousands of animals are reared, the generation of enormous quantities of animal wastes is a major concern. It’s a challenging task to manage the burgeoning wastes which otherwise results in environmental pollution contributing to climate change. On an average, a high milk yielding cow like, Holstein Friesen generates 40-50 kilograms of manure every day which translates to about 15 -18 tons per annum. One can imagine the quantity of wastes that thousands of such animals produce. Most of times these animal wastes are diluted with water and stored in lagoons or allowed to flow into the drainage or water bodies resulting in the pollution of both surface and ground water. There is enough research available on the direct effect of meat consumption and vulnerability to diseases like, heart diseases, colon cancer, diabetes, obesity, avian flu, blue tongue disease, Listeriosis and bacterial disease caused by E. Coli, Salmonella, Camphylobacter etc. The recent incidence of bird flu strain H7N9 is a matter of concern which can transmit the diseases to humans. New strains of the viruses pose a great challenge to public health. This can be an indication to opt for healthier and safer vegetarian diets. Research studies reveal that green house gas emissions (GHG) from beef ranges from 16-30 kg CO2-eq/kg compared to 0.8 kg CO2-eq/kg for wheat. It would be startling to know that in terms of GHC emissions one kilogram of beef consumption corroborates to about 150-160 kilometres of automobile usage. Meat based diets is one of the causes for hunger as large amount of food is diverted to animal feed. In a piece of land which is used to produce one kilogram of meat about 200 kilograms of tomatoes or 160 kilograms of potatoes could be harvested in the same time span. It requires about 5 to 15 kilograms of feed in the form of soybeans, corn etc to produce one kilogram of meat. Moreover this artificial extension of the food chain and converting the grain to meat results in huge loss of nutrients; 90% protein, 99% carbohydrates, 100% fibre and others. Vegetables and vegetarian diets are more climate efficient to produce protein than the meat based diets. The vegetarian food helps to reduce obesity, blood pressure, cholesterol, diabetes, heart diseases to a large extent in addition to conserving water, land and natural resources which otherwise is used for industrial animal production. All our actions are the resultant of the food that we consume. The more violently the food is produced and consumed violent thoughts and actions will only prevail. Entire humanity is suffering from hatred, anger, deceit, stress and a series of emotional disorders. Right type of food can be a solution. Meat based diets are the most efficient ways to waste food. You and I can contribute positively to address climate change by making conscious food choices. Last week I had an opportunity to participate and present a paper at the Regional Workshop on, ‘Strengthening Urban and Periurban Agriculture (UPA) towards Resilient Food Systems in Asia’ in Bangkok, Thailand. This workshop was jointly organized by FAO Regional Office for Asia and Pacific and PN Agricultural Science Foundation, Bangalore. Ten countries in the region participated in the workshop sharing their experiences and approach towards UPA. Urbanization is happening at a much faster rate than expected and is of a great concern world over. The global population reached the seven billion mark in 2011. After the six billion mark it just took 12 years to reach seven billion. The shortest time ever to add one extra billion signals a major shift in both the pace and scale of global demographics. During early 1800 about three per cent of the world’s population lived in cities. However, in 2011 there were 480 cities with populations exceeding one million as compared to just 80 in 1950. More than three billion people currently reside in urban areas and this figure is expected to rise to five billion by 2050. Global population growth is overwhelmingly concentrated in marginal urban and surrounding periphery of cities, especially in slums. This geographical shift has tremendous implications for the current and future dynamics of human development. With more than half the world’s population now living in urban areas, there is a growing interest in urbanization processes and the role of cities in sustainable development. The current trends of urbanization are reflections of the transformations that are being seen in the national economies where farming community are moving away from agriculture to industry and service sectors. It is expected that by 2020 the developing countries of Africa, Asia, and Latin America will be home to some 75% of all urban dwellers which would comprise of 85% of the poor in Latin America, and about 40-45% of the poor in Africa and Asia will be concentrated in towns and cities. Most cities in developing countries have great difficulties to cope with the urban population expansion which is often accompanied by poverty, food insecurity, malnutrition and unemployment. Such rapid urbanization and the harsh reality of urban poverty require sound strategies to ensure adequate food supply and distribution systems to address escalating levels of urban food insecurity and food safety. Urban and Periurban agriculture (UPA) provides a complementary strategy to reduce urban poverty, food insecurity and enhance urban environmental management if it is planned and designed appropriately. Urban and Periurban agriculture is much more than growing crops and raising animals within and around cities complementing rural agricultural systems in the production and supply of local food. In addition to food production, UPA provides a series of environmental services like clean air, carbon sequestration, reduction of green house gases, enhances biodiversity and many more. Also UPA supports related economic activities such as the production and delivery of inputs, processing and marketing of products and serves as an important ecological activity for income generation to supplement the revenues of urban and periurban families and therefore constitutes an integral component of urban socio‐economic paradigm. One of the approaches for UPA is utilization of the roof top space for gardening. Some studies estimate the roof tops comprise of about 30 – 40% % of the urban area which remains unutilized to a large extent. Roof tops provide a great scope in cultivating crops whereby the domestic biodegradable wastes and water can be recycled. The wastes can be transformed into resources (i.e compost) which can not only capture carbon but also provide manure for the plants to keep the city green and clean. During the workshop we had an opportunity to visit Laksi district which is about one hour drive from Bangkok to view the roof top garden project of the district administration. It was a beautiful model for the city dwellers to emulate. The technology used is very simple and appropriate to the city context. On the top of the seventh floor of the Laksi district office complex the open area of about 4,000 square metres was used for developing roof top garden. The initial investment to establish this garden was a mere 1000 Bhat (about 35 USD) says the Director of the Laksi District Office Mr. Narong Jungchamfa who takes special interest and pride in promoting the roof-top garden project. Under his leadership this project has won many accolades from various international and national organizations. About 100 different species of vegetables are cultivated in the open space which otherwise was not utilized. The most interesting aspect was that the wastes were used as resources for the preparations of a variety of formulations adopting organic farming practices. Shrimp wastes, soya meal, vinegar, yeast, coir pith and many other available materials are fermented and used for making growth promoters and bio-pesticides. The garden is maintained by Ms. Mam from the Laksi district office who shares her experience with exuberance and enthusiasm with the visitors. All the garden operations from sowing the seeds in the nursery, transplanting, nurturing the plants, plant protection to marketing are being handled by Ms. Mam. She cultivates a variety of leafy vegetables and fruits on the roof top. Every house generates lot of biodegradable wastes which to a large extent are disposed off adding to the existing garbage problem. If every household attempts to utilize the biodegradable wastes alone, the problem of waste management can be solved to a large extent. Roof tops may not be accessible for every city dweller; instead large pots can be utilized for cultivating vegetables on the balcony. Wherever rooftops are available don’t let the open space go waste use them for growing plants which in a modest way can contribute towards reducing the impacts of climate change. Wastes of biodegradable nature are of major concern both in the villages and cities. Enormous quantities of biodegradable wastes are being produced from farms, gardens, houses, apartments, markets and offices. Majority of the wastes are disposed off in the landfills while some end up in the open space or rivers and water bodies contributing to pollution. In the villages most of the farmers burn the wastes as it is easier to manage contributing to global warming and climate change. Wastes if not managed scientifically pose a sequel of problems related to their management and associated health and environmental hazards. Bio-degeadable wastes comprise of vegetable and fruit peels, garden clippings, and kitchen garden wastes etc which are degradable. Wastes, though considered waste are not mere waste. They are the misplaced resources which can be efficiently utilized with simple technologies. The waste management technology should not just aim at turning the waste benign, rather focus in bringing those resources back into place. In other words, the useless wastes should be transformed into a value-added product that can initiate income-generating enterprise. The approach should be “Turning filth to Wealth”. Different methods are adopted to mitigate the biodegradable wastes generated. Composting is one of the techniques, which is widely followed. The composts that are produced by inappropriate methods reveal their adverse features during storage, marketing and use. The associated problems include foul odours, fire, environmental pollution, nuisance, insect infestation and bursting of compost bags. Phytotoxicity of such composts is also a serious problem, which impairs crop growth and yield when used in agriculture. In addition, there are problems of the compounds like amines, sulphamines, mercaptans, skatoles etc. To solve the gamut of problems related to the conventional composting methods, vermitechnology is one of the alternatives. Vermitechnology is the method of converting wastes into compost by use of earthworms. Good quality compost is produced in a short period depending upon on the number of earthworms. In other words about 4-5 kg of wastes can be composted by 1000 worms (approximately 1 kg) in a day. The commonly used earthworms like Eudrillus sp. Perionyx sp., Eisenia sp. or any locally available surface feeding (epigeic) earthworms can be collected from the nearby soil and then used in Vermitechnology. A simple and efficient method of Vermitechnology “Pusa Vermitech” was developed during my Masters degree program at Indian Agricultural Research Institute (IARI), Pusa, New Delhi in 1996 which is low-cost and is ideal for the farmers. Now this method is widely adopted in India, Nepal, Sri Lanka, Italy and Costa Rica. Vermitechnology can be undertaken in a tank or on the soil surface. The tank can be constructed with bricks or stones depending on the availability of materials. The height of the tank should be 0.75 metres, width 1 metre and length can be 3 - 4 metres or even more. The base of the tank should have a slight slope directing towards two drainage holes. The first layer (5-10 cm) at the base is of sand as it helps in the drainage of excess water and also prevents the movement of worms into deeper layers of soil or out of the tank. On the top of the sand, a layer of one month old dung is laid. This layer is approximately 3-5 cm. thick. On the top of this dung layer all the biodegradable wastes are put and the tank is filled up to the brim (65 cm) with the waste. The wastes are covered with a thin layer (1-2 cm) of soil. Above the soil layer mature dung is uniformly spread (3-5cm) which forms the top layer in the tank. In other words, the wastes are sandwiched by two layers of mature dung. The contents are moistened with water (40-50% moisture level) for 7 days to pre-decompose the contents. After pre-decomposition, worms are introduced (1000 worms which would be approximately 1 kg for 100-150 kg of wastes) and watered regularly to maintain 30-40 % moisture level for better activity of worms. Watering is done in such a way the contents in the tank are not too soggy or too moist as it results in anaerobiosis of earthworms causing mortality. The tank is covered by a gunny sack in summer months to avoid evaporation of moisture. In places where the predators like rats, lizards, pigs are a major problem; the tanks can be covered with wire mesh to prevent them feeding on the earth worms. Vermicompost appears on the top of the tank in the form of pellets. When this layer of vermicompost becomes a few centimetres thick watering should be avoided for 3-4 days. The reduced moisture at the top layer will force the worms to move down towards the lower layers. The compost formed is heaped in the corners of the tank by gently scrapping with a shovel or a wooden raft and left for a day or two. By this method of collection of wastes the young worms and the adult worms are not damaged while handling. In this manner the compost can be collected every 7-10 days till 80% of the material is collected i.e 10-15 cm layer is left at the base. The tank/heap should be refilled with pre-decomposed wastes. 1. Spread a thin layer (10 cm) wastes and sprinkle cow dung and moisten it. 2. Likewise make layers of waste and cow dung up to 0.5 metres height. 3. Moisten the heap regularly with water for 10 days. 4. During the process high temperature develops and cools down in a week. 5. Check the temperature of the heap by inserting a stick. 6. If the stick heats up, leave the decomposing material for 3-4 days more and when the temperature is normal then only it should be used. Such pre-decomposed material is put on the heap or tank up to 75% of its height. The standard procedure of Vermitechnology as mentioned above is continued i.e over the pre-decomposed waste, thin layer soil is spread and above it dung is spread. The worms come on the top and start feeding on the waste. 2. The tank /heap should be moistened with water regularly. 3. Appropriate shade should be provided at the site where Vermitechnology is undertaken. 4. Wherever the predators like rats, lizards, pigs etc., are found, wire mesh should be put on the top of the tank. It is very important that the method adopted should be scientific degrades the waste faster, the end product i.e. compost should fit into the basic criteria (i.e. quality parameters) of marketing of manure. The compost should not have any bad odour which will not be acceptable by the users. To be the choice of consumers, the final product should be friable and uniform with positive visual characteristics and attractive packaging. Mere degradation is not composting, rather composting is a scientific way of desired degradation. There is a tremendous scope for the production of quality manure by vermitechnology. The growing awareness about organic farming, home and kitchen gardens world over is an added advantage and a positive step in launching a quality product at this juncture. This will not only manage the wastes but also would generate income.